10:05 - 11:05 am "What Will The Affordable Care Act Do To Me?" This session will define the role of the surgeon in the new health care world. 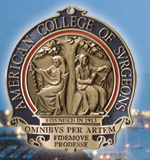 In this contest, surgical residents from each of the ten general surgery residencies throughout Massachusetts will be invited to showcase their laparoscopic skills. The competition will consist of teams of 3 residents from each institution participating in a series of tests where laparoscopic skills such as intracorporeal knot tying, transferring of objects from one hand to another, and pattern cutting will be timed and graded. The winners of the competition will receive a trophy to showcase at their institution for the year.